Today (well actually, tomorrow, May 10th, but it’s nightfall in Israel, so the next day on the Hebrew calendar has officially started) is Israel Independence Day (“Yom Ha’Atzmaut”) as celebrated in Israel. The official date on the Christian calendar is May 16th because Israel was officially recognized as a state on that date. But, in Israel, it is celebrated according to the Hebrew/Jewish calendar, thus the discrepancy. Regardless, I’ve chosen to post this photo, below, today. You won’t see it anywhere else because it’s from my personal collection. 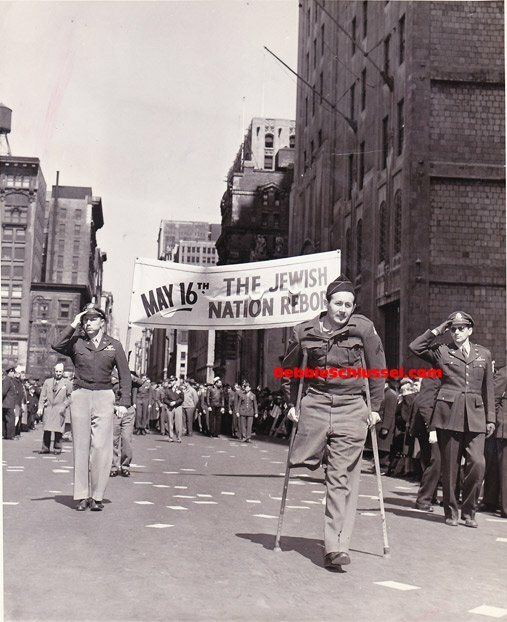 It’s a photo of Jewish U.S. World War II veterans, including one who lost his leg in the war, marching in a parade in New York City on May 16, 1948 to mark the country’s independence. I believe that some of these soldiers were still serving in 1948 when this photo was taken and were marching in full, official uniform. I wonder if (and doubt that) the U.S. Army would allow something like this, today, as our military now bows to the will and mandates of Islam (including in the burial of a Muslim mass murderer of thousands of Americans). This is my favorite photo because it says so much, and goes back to an era in which America truly was at war with and successfully defeated its enemies, rather than pandering to them. An era in which members of the U.S. Armed Forces celebrated what was good and right and decent in a parade. Those who sacrificed for our country against the Nazis supported Israel’s independence amidst Muslim Nazis. By the way, there is a reason the sign says, “The Jewish Nation REBORN.” It was always the Jewish State–for thousands of years. That was only the date the world recognized it. Check out this terrific photo . . . The mandates of Islam have nothing to do with it. A serving member of the United States armed forces is never supposed to take part in any kind of demonstration, ever, by any kind of interest group while in uniform. I sympathize with their cause as I am a Zionist myself, but serving members of the armed forces must never demonstrate in uniform. Retired and discharged members, most of whom were in this photo, are another matter altogether. 60 years ago. What has happened to our country. I wonder who it is that they’re saluting as they parade by? Great photo & write-up, but today is actually Yom Hazikaron. Tomorrow [May 10 in Julian calendar] is Yom Ha’Atzmaut; the 5th of Iyar. They moved the date to avoid desecrating the Sabbath… the Jewish day begins at nightfall and it wouldn’t do to celebrate Yom Hazikaron on Saturday night so it was moved one night ahead. If the two holidays fall too close to the Sabbath, an adjustment is made so they don’t take place after its over. And neither holiday can ever fall on the Sabbath for obvious reasons. In Israel, the Hebrew calendar determines all official and religious observances. Israel’s “secular” birthday is May 14th and that is when the Palestinian Arabs mourn Israel’s existence. You know the folks who think Bin Laden should be buried with them and to whom every one wants to give a state. I love it when NormanF educate us on the Jewish religion, we who are not Jewish get to learn so much. I do have a Jewish ancestor and yes, I’ve done much reading on Judaism and Israel. I get tired of Israelis whining how much the world oppresses them and no one understands them. Its a legitimate point but the way its phrased in Israel sounds too much like an apology. I’d like more to see Israel stress all the positive contributions it makes to mankind, to see Jewish culture, faith and scientific and technological achievements given more publicity. There is a lot for Israel and the Jewish people to be proud of. Those things need no defense. Great photo Debbie and Happy Independence Day to Israel. Debbie, thank you for sharing this special memory. Happy 63rd birthday to Medinat Yisrael. I’m a member of a local Disabled American Veteran chapter. We have a member, well into his 80’s, who is amazing. He was originally from Hungary. As a boy, he and his entire village was force marched to the Bergen Bilsen Concentration Camp. After the war, he was sent to Cyprus, and then to Palestine, where he fought in the War of Independence. A few years later, he came to America and (wouldn’t you know it), was drafted into the US Army. He was then sent back to Germany! He ultimately went to Korea, and then to Vietnam where he was wounded. Today, he is very active with our DAV chapter. As I said, he’s an amazing man.